Egyptian-Filipino expat Sarah Mohammad has been part of that change. “Dubai has a great community and you are constantly meeting people from everywhere,” she says. “I’ve lived here all my life and I’ve made new friends every year.” She and her partner are one of the six resident cross-cultural couples in our Valentine’s Day special. However, the city just provides the setting. What you make of it is up to you. The meeting: They first met six years ago in Abu Dhabi and Melroy says it was just like the movies. He even remembers what she wore that day. The test: When they first started dating she was based in Dubai and he lived in Abu Dhabi. The commute didn’t make it easy to see each other, but Melroy started to spend a lot of time behind the wheel. ”I should have known he was first interested when he drove through six times in one week to see me,” says Beth. The proposal: Beth says Melroy’s proposal was nothing less than perfect. Happily ever after: They wed two months ago and are moving to Abu Dhabi for Melroy’s new job and making their life together in the UAE. Beth says it would be very difficult to choose between their home countries but Melroy says the perfect situation would be to spend summers in Scotland and winters in Goa. The meeting: On Shaheen’s first full day in the UAE, at a new job, one of her colleagues left his brother at her desk while he went to a meeting and asked her to look after him. The test: Shaheen says they had a lot of challenges to face when they decided to make a life together. Hamoodi is a Syrian Muslim and Shaheen is a Parsi from India’s Zoroastrian community. Neither wanted to convert to the other’s religion and it was challenging for both families. They were married at her home in India in 2004, with only immediate family, but of course, their small and cosy wedding still had 250 guests. Happily ever after: Despite the early conflicts, Shaheen, Hamoodi and their eight-year-old daughter Allegra have found their perfect balance. They want to stay in Dubai as neither of them wants to live in the other’s home country. “No matter what the future has in store for us, we’ll be happy in our little bubble,” says Shaheen. The meeting: They met through friends in 2012 and Sarah says he didn’t make a great first impression. “He never spoke to me and I just thought he was arrogant,” she says. The next time though, at a friend’s fancy dress party, he, dressed as a gladiator, fought hard to win her approval and a three-year friendship was struck. The test: For 18 months Joe asked Sarah to date him, unsuccessfully, as she had strong ideas about what her family would want in a potential husband. “I thought Dad expected me to marry an Egyptian, or someone closer to our cultural background,” says Sarah. Eventually Joe got sick of it. Her mum was on Joe’s side and urged Sarah to go to her father. She said Joe’s loyalty and strong family values would be a great selling point. The proposal: So, Sarah picked her time, after a family friend’s wedding, told her father about Joe and arranged their meeting. “I prepped him and told Joe how to answer certain questions,” she says. Happily ever after: They had two traditional wedding ceremonies: a Nubian-themed one in Egypt, and another at a country estate in the UK. Since then she has set up her business, Secret PR, and he commenced full-time studies as a pilot with Air Arabia. The couple are about to celebrate their first anniversary. The meeting: Carolyn was socialising with a mutual friend after a stressful week in early 2013 and when Ed showed up they didn’t hit it off at all. The proposal: Ed realised how important romance was to her and knew he had to give her a beautiful story to tell. But it wasn’t easy. They were holidaying in Bali but it was difficult to find the right moment. “We were sitting on our patio having a normal evening,” she says. “I think we were arguing.” Ed directed conversation towards their future but Carolyn didn’t want to talk about fairy tales. “He said ‘Whatever, Caz!’ and stormed off inside,” she explains. Moments later, he returned with a ring and said she had to be his wife. She asked if he was mad and he agreed that he might be. Happily ever after: “It’s funny; that initial irritation is something that I find quite endearing in our relationship now,” Carolyn says. They are getting married in October and want to buy a house here. Both love Dubai and have no intention of leaving. The meeting: They met in 2009 when Aldrin was working at a bank and Jasneet was part of an outside project team. Aldrin kept asking her out but Jasneet had the impression he was the office clown, so she refused, until he wore her down. “After a bad day, I finally said yes to dinner,” says Jasneet. The test: After her project in Dubai ended, Jasneet returned to India and they maintained a long-distance relationship for eight months. At that point Jasneet grew frustrated. “How many coffees can you have?” she says. But the biggest challenge was they were of different religions — he’s a Catholic and she’s a Sikh — which was a major consideration for their families. They spent some time convincing her family that he was husband material before she converted to Christianity. The proposal: Jasneet and Aldrin view their proposal as unconventional in that he discussed marriage with her father before he did with her. Even after visiting her parents in Punjab, there wasn’t a conventional proposal, just an agreement to move forward together officially. Happily ever after: They were married in Goa in 2011 and say that as with any relationship, there have been good days and bad days and each has been a learning experience. “We complement each other’s virtues so that we can balance out each other’s personalities in each of these situations,” says Aldrin. The meeting: Six years ago, Elsa joined a breakfast networking group when she started her business Q Communications, so she began to see Nicholas at weekly meetings. The test: Elsa says she guessed he liked her because he kept inviting her to one-to-one networking meetings, with no real business case. But even then, he played it cool with her. “I asked him if he was on Facebook and he said he was, but he only allows people he knows really well to see his profile.” This only made Elsa determined to know more. The proposal: Nicholas surprised her with business class flights for their holiday to Las Vegas and planned his grand gesture with help from the Emirates crew. He convinced Elsa to accompany him to the lounge on board the Airbus A380 even though it seemed closed. “I pulled open the curtain and they were standing in a semi-circle and looked like they were having a briefing,” says Elsa. Happily ever after: Elsa and Nicholas are getting married in Dubai in a month’s time, though Elsa’s friends do wonder why they didn’t choose to have the ceremony at her home in South Africa. “We love Dubai. This is our home. That’s why our wedding is here. It is the world’s greatest common garden worked in a desert city. It is the world’s greatest characteristic garden worked in a desert city that has no simple water supply separated from the ocean. It is the world’s greatest regular garden worked in a desert city that has no simple water supply separated from the ocean, and plonked in full daylight just adjacent to a seven path motorway. The supernatural occurrence is that the person or lady who concocted this insane thought didn’t get chuckled out of the workplace and the bank. 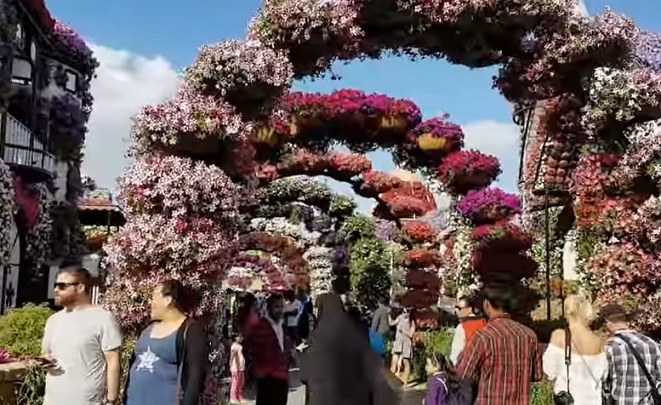 Though the desert is maybe not the clearest area for a mammoth blossom plant, the Dubai Miracle Garden is only that. Situated in Dubai’s Al Barsha South, the Dubai Miracle Garden’s amazing number of blooms and hallucinogenic looking structures no uncertainty keeps with the city’s consistently developing number of record-breaking structures and occasions. 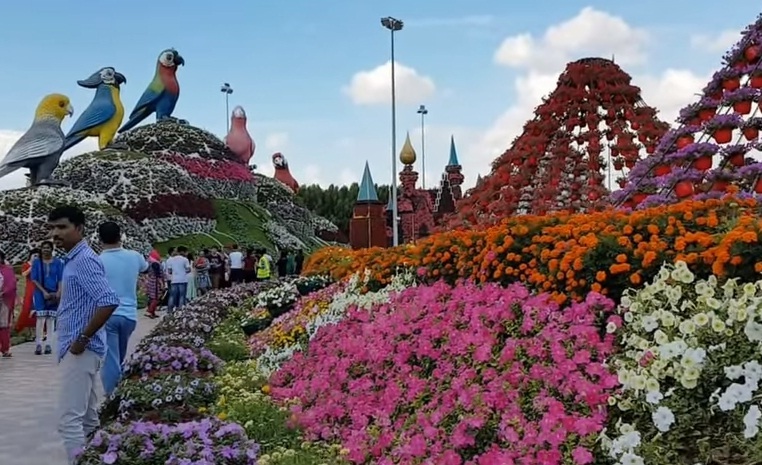 We’ve gathered together some the most unbelievable pictures from the Dubai Miracle Garden that are certain to influence you to need to drop everything and pay this eye-popping territory visit. Scattered along the garden’s walkways, there are padded swings that you can sit on to absorb the environment. I should state it truly is very dazzling to remain for some time at this garden. 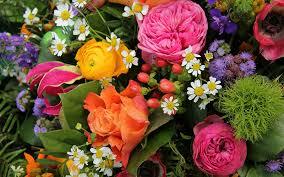 You will enjoy to walk along beautiful flowers. Whenever to propose someone the first thing that comes to mind is the location, location, location….. 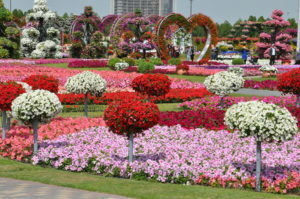 So, the Dubai miracle garden is the best place to propose someone between the beautiful flowers. Think about abandoning it till late in the day; it is far less swarmed meaning you have the capacity to take pictures beside a portion of the green jewels as opposed to the winding group. Opening hours are 9am-9pm on weekdays and 9am-11pm in the ends of the week, in season. There will be a palatable plants plant where you’ll have the capacity to make your own excursion and eat it on the grass. Likewise a restorative garden and a butterfly cultivate with 9 vaults loaded with butterflies and a historical center.